Hi everyone, I've been busy crafting jewelry and getting my daughter graduated from High School - woo hoo, and now getting ready for company and vacation. Now that I have a minute to spare I thought I would share a few of my new pieces and to let you know that I am having a Summer Sale! Use coupon code JUNESALE when checking our for 15% off your order at Alyssabeths. 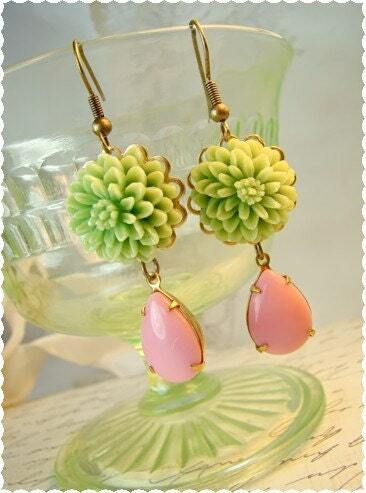 Emma Pink and Green Flower Earrings Adorable and fun, my Emma earrings are crafted with vintage large opaque pink vintage glass teardrop jewels set in brass which are suspended from precious green dahlia cabochons set on scalloped edge brass settings. 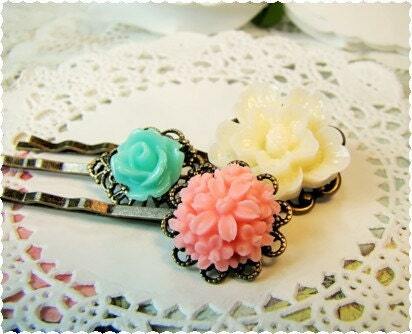 Shabby Chic Pink, Aqua & Ivory Hair Pins Romantic summer garden hair or bobby pins crafted with rose and flower cabochons in retro Shabby Chic colors of coral pink, aqua and cream set on three different styles ofantique brass filigree pads with 2” bobby pins. 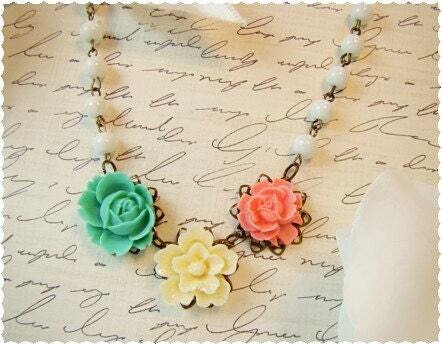 Shabby Chic Retro Garden Necklace Romantic summer garden necklace crafted with rose and geranium flower cabochons in retro colors of coral pink, aqua and cream. These lovely flowers are set on a hand wired vintage white glass beads and antique brass chain. Flower cabochons are set on brass lace edge settings and each measure approximately 20mm.